The food we eat not only provides us energy, but it also supplies nutrients to help the body remain healthy. The most important of these nutrients are minerals and tiny organic compounds called vitamins. While all of the thirteen known vitamins and eleven minerals play a role in overall health, a few are especially important for your mouth. 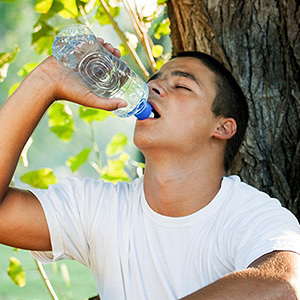 For example, vitamins D and K and the minerals calcium and phosphorus are essential for strong teeth. Another mineral, fluoride, helps fortify enamel, which can deter tooth decay. Other vitamins and minerals serve as antioxidants, protecting us against molecules called free radicals that can damage cellular DNA and increasing our risk of cancer (including oral). Vitamins C and E and the mineral selenium fall into this category, as well as zinc for DNA repair. We acquire these nutrients primarily in the foods we eat. But for certain people like older adults or pregnant or nursing women a healthy diet may not be enough. Any person who can't get enough of a particular vitamin or mineral should take a supplement to round out their nutritional needs. If you don't have a condition that results in a nutrient deficiency, you may not see that much benefit from taking a supplement. In fact, taking too much of a dietary supplement could harm your health. For example, some studies have shown ingesting too much supplemental Vitamin E could increase the risk of heart failure or gastrointestinal cancer. And some dietary supplements can interact poorly with drugs like blood thinners or ibuprofen. The best way to get the vitamins and minerals your body — and mouth — needs is to eat a healthy diet. Dairy products like fortified milk are a good way to get vitamin D, as well as calcium and phosphorus. Fruits and vegetables are a good source of Vitamin C. And while you can take in fluoride from toothpaste or other oral hygiene products, you'll also find it in seafood and tea. While good oral hygiene and regular dental visits are necessary for dental health, your diet can also make a difference. Be sure you're getting all the nutrients your teeth and gums need. 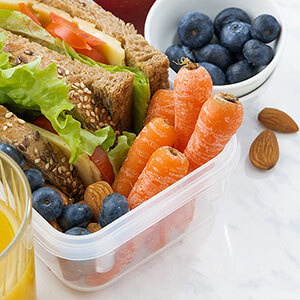 Sending the kids back to school means it's time to start packing those lunch boxes! What your children eat and drink can have a big effect on their oral health. So it's important to know what the best choices are… and what to avoid. 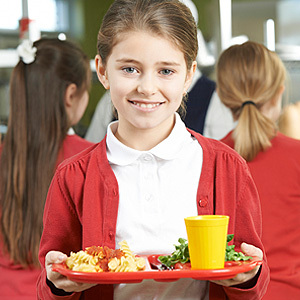 Here are some tips for sending your kids off with a tooth-healthy school lunch every day. The scientific evidence is overwhelming that sugar is the most important dietary factor in causing tooth decay, and soft drinks are the largest source of sugar in many kids' diets. Even natural fruit juices have unhealthy amounts of sugar. So when it comes to beverages, keep it simple: H₂0 is the way to go! Healthy food that's low in sugar doesn't have to be boring! You can use cookie-cutters to shape calcium-rich cheese and whole-grain bread into flowers, stars — even dinosaurs. Unbuttered popcorn can be flavor-boosted with a dash of cinnamon or parmesan cheese. There are all kinds of ways to get creative. While fruits and vegetables do have some sugar, they are a good choice for a healthy smile — and a healthy body. That's because they also contain plenty of water and fiber, which slows the body's absorption of the sugar… and even helps clean the teeth! Kids enjoy the naturally sweet taste of bite-sized fruits and vegetables like cherry tomatoes, baby carrots and seedless grapes. And the cheerful, bright colors of these nutritious little nuggets make them even harder to resist! Of course, even with a healthy diet, your kids still need to practice good oral hygiene at home, and have regular professional cleanings at the dental office. If you have any questions about nutrition or oral hygiene, contact us or schedule an appointment for a consultation. And have a happy, healthy — and delicious — return to school! Refined sugar is a prime food source for disease-causing oral bacteria. As bacteria consume sugar they produce high levels of acid that over time can erode enamel and leave a tooth vulnerable for decay. The solution to stopping this vicious process is simple: cut back on eating refined sugar. The reality, though, is a bit more complicated. Many of us seem genetically hard-wired with a “sweet tooth,” perhaps a remnant of our early ancestors' sense that sweet foods were a safe means to obtain energy. Food manufacturers likewise don't help with making this dietary change — the number of items with added sugar has ballooned over the last several decades. We can trace a lot of this back to the unintended consequences of past government guidelines that called for removing fat from processed foods. But this also removed flavor, so manufacturers began adding sugar (under a myriad of names) to compensate. 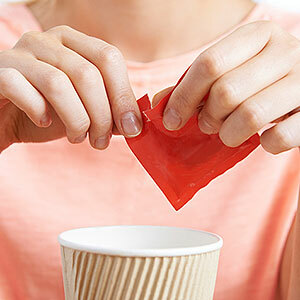 Sugar consumption is now a hot health topic for its suspected connection with inflammatory diseases like diabetes and cardiovascular disease, as well as dental health. We now have a love-hate relationship with sugar — we want to show it the door but we can't quite bring ourselves to let it go. The situation has created a market for artificial sweeteners. The amount and types of sugar alternatives has exploded since saccharine first emerged in the early 1960s. With these increased choices, though, there have also been increased concerns over their health impact, including in the mouth. This concern has prompted numerous research studies. The conclusion: artificial sweeteners don't adversely affect the health of most people. And, from a dental perspective, artificial sweeteners can have a positive impact on teeth and gum health because unlike refined sugar they don't promote oral bacterial growth. In fact, one particular sweetener may be even more beneficial to your teeth: xylitol. This sweetener, which comes from a sugar alcohol that oral bacteria can't digest, is often found in chewing gums, hard candies or mints. Â In effect, xylitol “starves out” bacteria to help prevent tooth decay. From a dental perspective, replacing sugar with an artificial sweetener (especially xylitol) can be advantageous. And less sugar could mean more good news after your next dental checkup.